Salt - What is home? It was my turn to set the challenge on Salt this week. I have been pondering lately on HOME. 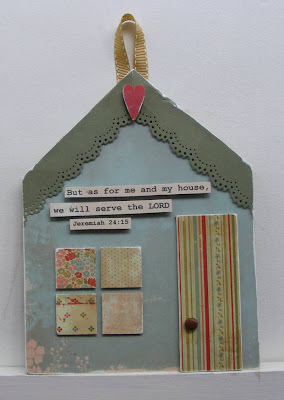 What makes one and how does Jesus make mine different to other homes. We all have different routines, rituals, habits, priorities etc that will shape how our home works. But in the Christian's home we have the addition of Jesus Christ himself. How does he make a difference to your home? Is he the 'unseen guest at every meal', is he consulted on decisions made, is your home a place where the stranger is welcome and hospitality is practiced? Perhaps more importantly your home on earth is temporal. Do we truly recognise that our treasure is in heaven and that earth will fade and pass away? Although our homes are important for the nurture and training of children, a rest away from the world and and a tool for ministry, Christ is building our mansions in Glory. Please enjoy looking at the creations from the Salt team, be inspired to make a card, layout or other paper craft. Maybe something for your home to remind you of Jesus and how he wants your home to be. Paper by Cosmo Cricket, Martha Stewart lace punch,Marvy Uchida heart punch, brad by Basic Grey, verse printed via computer.